The 9 Best Pumpkin Patches in Delaware! No season is quite as nostalgic as autumn. From childhood bonfires, to your first haunted hayride, to a warm sip of apple cider, nothing compares. For many of us, some of the best moments in life have happened in or near a pumpkin patch. There’s something to be said for the serenity one finds when surrounded by oversized gourds, craftily decorated stalks of corn and vibrant orange pumpkins. 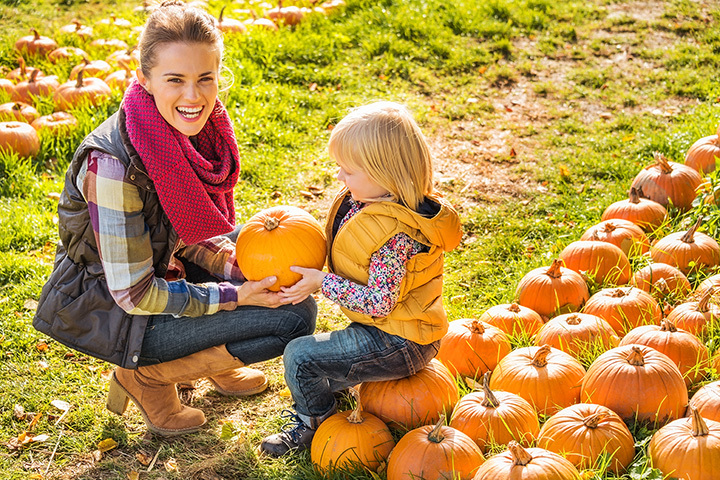 In the spirit of helping you build up your repertoire of enchanting memories, we’re proud to present you with our top picks for Delaware pumpkin patches. Located in Camden-Wyoming, Delaware, this rural orchard is among the best for its accessibility and variety. Fifer's is not only family friendly, it's also family run. The farm is open Monday through Saturday from 9 a.m. until 6 p.m. and their corn maze features six acres of amusement. Pumpkin pickers here can indulge in hours of carnival games, spiral down straw sliding boards and partake in pumpkin painting and other fun adventures. Seasonal features change daily but often include train rides, live music, a moon bounce and fall favorites like cider, squash and family festivals. As for pumpkins, their u-pick patch is overflowing and also contains other popular fall decor items. Wilmington, Delaware, exhibits true autumn beauty and Ramsey's Farm does a great job of capturing its versatility. Like much of Wilmington, traces of rural scenery creep into this urban landscape and the end result is city convenience intertwined with sweeping countryside sights. Here you'll find acres of sprawling greenery, intricately crafted mazes, varying types of squash and more than 20,000 pumpkins to pick from. Ramsey's Farm, located at 330 Ramsey Road has a calendar brimming with daily and nightly activities ranging from bon fires to food drives to tours. Be sure to check that calendar for availability as their hours of operation vary widely throughout the season. Don't let the name fool you—Delaware’s famous Christmas tree farm has plenty of pumpkins to pick through. This farm is open seven days a week for the fall season and they even feature free hayrides on weekends. Pick your favorite pumpkin here anytime between 9 a.m. and 5 p.m. and don't forget to snap a selfie beside their famous painted teepee while you’re at it. Any pumpkin picker who treasures autumn at the beach is guaranteed to love this chic, independent pumpkin shanty. This unique pumpkin patch is manned by a real-life farmer’s daughter and she knows a thing or two about combining seasons. While you’re here, you’ll be able to achieve a few unique experiences like picking pumpkins by the sea, stocking up on autumn and winter décor simultaneously and saving 20-30 percent on your purchase. Bargain shoppers and ocean lovers alike would gain a great deal by making this pit stop. If you have a busy schedule, you can pick your pumpkin in a flash at Middletown’s acclaimed Filasky’s Produce. They quite literally roll out the wagon in honor of fall. Said wagon is filled with fresh pumpkins, gourds and other seasonal delights. Filasky's opens early in the morning, making it an ideal stop for pumpkin pickers on the go. Other noteworthy attractions here include farm fresh ice cream, hayrides at select times and farm to table dining. If you like a bit of barbecue to coincide with your pumpkin picking, the niftily named Mr. Pepper’s Pumpkin Patch in Laurel, Delaware, is a great location for you. Their barbecue shack and beehive are two additional features you won’t find at other pumpkin patches and their hayrides are reasonably priced at just $2 per rider. Bridgeville, Delaware’s T.S. Smith & Sons farm maintains the region’s oldest operating facility for apples, peaches, and nectarines but you might not know they also feature an amazing variety of pumpkins. The farm is situated on 800 sprawling acres and makes for an ideal place to host a wedding, party or picnic. Loblolly Acres is just a touch off the beaten path in Woodside, Delaware, but for pumpkin enthusiasts it's worth taking a back road or two. This family-oriented farm sports a striking pumpkin patch, plus a petting zoo and corn maze. There's even a corn pit and on-site nature trail. The farm is open seven days a week and has features you won't find elsewhere which make it unique. Among them are a cafe, an intricate play area and an awesome autumn jubilee. From scary attractions like the Wicked Woods to child friendly features like a petting zoo and pony rides, Wicked has it all, not to mention an amazing variety of pumpkins. If a well-rounded experience is what you’re after, you’ll find that Wicked R Western Productions, located in Wyoming, Delaware, fits the bill.